The first out of the three races compiling the Triple Crown of Thoroughbred Racing in the United States is the Kentucky Derby, North America’s most attended event in national horse racing which is said to be “The Most Exciting Two Minutes in Sports”, implying that it is the most popular sporting event in North America, and the most attended of all horse racing events in North America, one which bears immense popularity among sports fans and horse racing enthusiasts. The Kentucky Derby is a stakes race, much like the Preakness Stakes and the Belmont Stakes, its followers in the Triple Crown of Thoroughbred Racing. It is a 136 years traditional grade 1 race for 3 year old Thoroughbred colts, geldings and fillies which marks the end of the two week Kentucky Derby Festival and was first held in 1875. The Kentucky Derby is held annually at the Churchill Downs racecourse located in Louisville, Kentucky and is run over a distance of 1mile 2 furlong in the left-handed dirt track of the Churchill Downs racecourse. Kentucky Derby rules set the age of qualification as 3 year olds and the weights carried by the horses as 126 pounds for colts and geldings and 121pounds for fillies. The winner of the Kentucky Derby is traditionally covered with a blanket of roses, which is why the race is referred to as the “Run for the Roses”, and receives a purse of nearly $1.5 million out of the $2 million purse for the race, when the rest of the purse is divided among the 2nd, 3rd and 4th place. After returning home to US after visiting the Epsom Derby in England and the Grand Prix de Paris in France, Col. Meriwether Lewis Clark, Jr. lead to the erection of what is now known as the Churchill Downs racecourse. With help of the Louisville Jockey Club he raised money and received lands to erect the racecourse upon from his relatives John and Henry Churchill, which the course is named after. The first Kentucky Derby race was run by 15 three year old horses in front of a crowd of 10,000 people over a distance of 1 mile 4 furlong in May 17, 1875. Despite being a profound success, the racecourse experienced financial difficulties in the years to follow when even an effort on made by the New Louisville Jockey Club in 1894 to raise funds and improve the course’s facilities failed, and it wasn’t until 1902 that Col. Matt Winn arranged a group of businessmen to purchase the Churchill Downs racecourse. 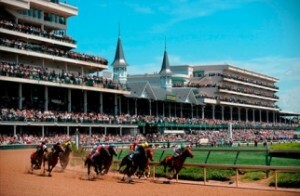 The racecourse started to flourish afterward and the Kentucky Derby race became the zenith for 3 year old Thoroughbred racing. Nowadays, even after all these years, the Kentucky Derby is more popular than ever, attracting tens of thousands of racegoers, celebrities and members of the British Royal Family, and cooperates with major brands who provide support and sponsorship for event. The hype in month preceding the race is amazing. Commentators analyzing every bit of it with horse racing betting activity going through the roof with the leading sportsbooks and thousands of horse racing fans booking Kentucky Derby tickets.